Who knew that you could knit, drink coffee, eat, chat, and exercise all while sitting at Panera’s? However, this morning “blondie” enlightened us!!! As we were talking, she explained “oh as we are talking about this, I’m doing my Kegel’s!” Oh yessiree Bob, she said it at Panera this morning. Which of course led to other subjects amid all kinds of giggles and laughter! I love my knitting friends – no subject is taboo and no matter what the subject is, we laugh!!! One knitting friend even said she took my advice regarding a problem with a pattern she was having…I told her to contact the yarn company; pattern calls for a #4 needle and for her to get the gauge, she had to use a #9; she got a reply back explaining why she should be using the #4 needle – basically the yarn will grow (it’s bamboo yarn). Comments Off on It’s planting time! This has been fun so far, seeing how quickly the seeds germinated and grew. 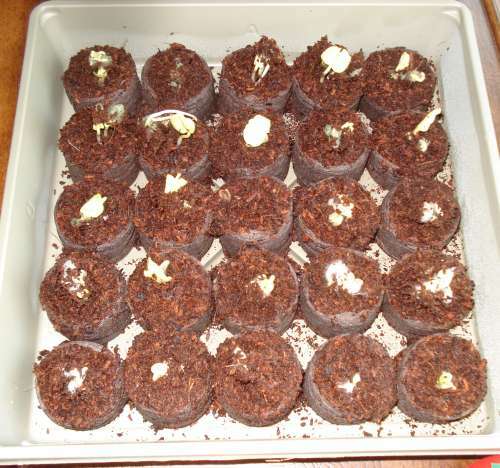 Just hope I can keep it growing….now to get some soil and get these baby’s in the ground!!!!! 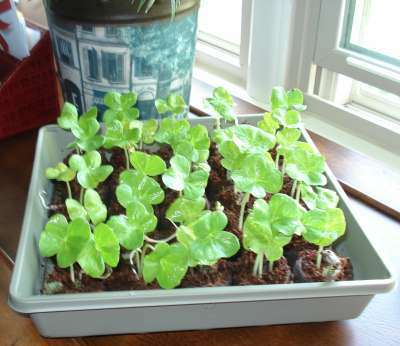 Even tho’ these might look like …ah…cinnamon rolls, they are really my cotton seeds sprouting! I’m so excited……only took a few days for this to happen. WOW! Today was a very informative day at knitting at Panera. 1. If you knit fast, you won’t run out of yarn! (ie: in case you think you’re going to run out while working on a project). 2. Knitting a lace project doesn’t take as much yarn as you think it will because it’s full of lacey holes! Gotta love the knitters because they know how to have fun and most of all….LAUGH! My own personal philosophy is: It’s better to have it and not need it, than to need it and not have it! I hope your day has been enriched because of the above info! 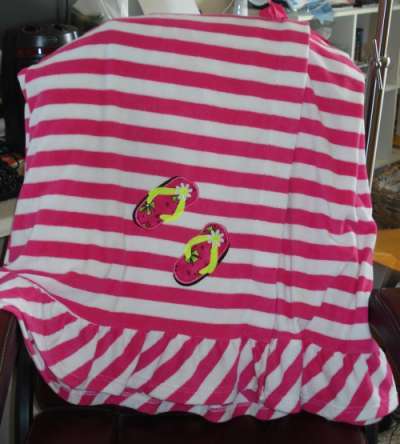 This is one of those purchased beach cover-ups that wraps around you and closes with velcro. I thought it needed just a little pizzazz so I appliqued some flip flops on it. Cute, huh?